Will you please stop writing all this tripe for which you have no evidence, does being rude about people come naturally to you? Must say I am a bit surprised at the speed at which the thread that some of us find amusing was move so quickly without any real discussion. All kicked off by somebody who has been on the forum for two whole days. Admin does seem like a nice chap, can I ask that the "Thread moved thread" be made a sticky and placed at the top. Just for a laugh. Well, I'm sorry if you feel hard done by. I calculated that going to the new forum, reading the Word Association thread, filling in your contribution, jumping over to the ComeAllWithin forum will now take you precisely one mouse click extra. I think you'll adapt. And in fact it was "never sleep", with over 50 posts, who first suggested the separate forum. As I said, I'd been mulling this over for a while as I've had a few PMs on the subject from folk that didn't like the way the thread kept getting between "rugby" threads. I can (and will) easily adapt, surprised that others cannot. Well Victoria it seems you are rather easily upset. I rarely contribute to it, but it's just a bit of fun, if you don't like it don't read and don't contribute. Perhaps live and let live? As for the guff about "big boys and girls", we'll just ignore that silly comment. Many if not all that post on the wa thread also contribute alot to other discussions about, yes you guessed it rugby! Let’s not forget rugby is a very serious business and no one who plays it or watches it likes messing about, alcohol, drinking pints of sick or anything silly. We’re Quins - it’s wax jackets and share portfolios all the way damn it. We won’t tolerate entertainment - just look at last season. Got to disagree with Admin on this decision. The thread was clearly marked as O/T. We had discussed this back when we moved to the new platform and there was general agreement that this was the best method going forward, rather than setting up multiple sub-boards. For those complaining about it being here, is it *really* so hard to not click on it? If you get there by clicking on the "previous/next" option from another thread, a simple extra click takes you past it to the next thread without you having to endure seeing it. As for the poster who has recently joined & been more than a little insulting to those who have posted on the W/A Thread, I can only say that you need to take a look at your attitude towards fellow posters. Being insulting or abusive is not on. 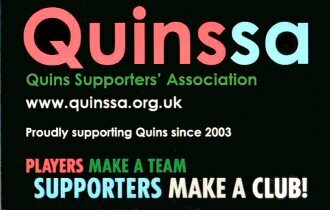 We are here because we are Quins fans. Some of us like to have a little fun (especially in the off-season as we are now). That doesn't mean we don't take rugby seriously. And in fact it was "never sleep", with over 50 posts, who first suggested the separate forum. Just for info, at times I do join in on the word association thread and at other times I find it annoying as it always shows up on my nice clean screen of unread threads. We did say that, and I tried to stick to it. But as time went on I became more convinced, partly by other people, that it maybe wasn't the right decision. I was already teetering on the idea of moving it when this thread hit the whirly thing. So we're trying it the other way. As I say, using it is all of one more mouse click in your visit to the forums to make a post of the thread then get on with the rest of the rugby messages. Let's try it like this for a week and see who is really upset in 7 days time. For info, for the techies. and I use Hermit to get notifications on myphone for any changes. Simples. If you just want to track a few threads you're interested in, you can use the "NOTIFY" button on the thread.